Team Honda's David Bailey won the 250cc U.S. Grand Prix at Unadilla, topping defending FIM Motocross World Champion Danny LaPorte and Honda support rider Brian Myserscough, who nearly pulled off an upset win by leading much of the race but was worn down in the 40-minutes-plus-two-laps motos. Bailey's win came at a tough time for LaPorte, who was locked in battle with Belgium's Georges Jobe, the 1980 FIM 250cc Motocross World Champion and a future 500cc champ. He had won only one GP out of nine to that point and was losing his grip on his #1 plate, the first for an American in 250cc Grand Prix racing. On that same day in Finland, Yamaha's Jim Gibson, another California ex-pat racing in Europe, went 2-2 to take the Finnish 125cc Grand Prix. Marc Velkeneers ran 1-3 on a Gilera, but Gibson won the overall based on elapsed time. Jim Gibson raced the 125 Grand Prix tour in 1983. The U.S. Yamaha team earned the Manufacturer's Cup for the Yamaha Inter-Am Series, which was won by Gary Jones. 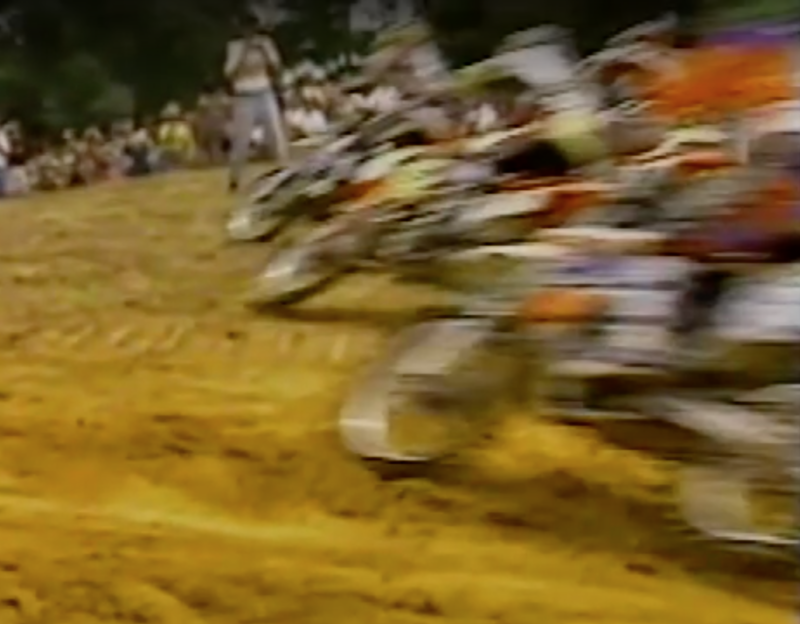 His teammates were his brother Dewayne, "Jammin'" Jimmy Weinert (who's down here at Loretta Lynn's this week), and Marty Tripes. 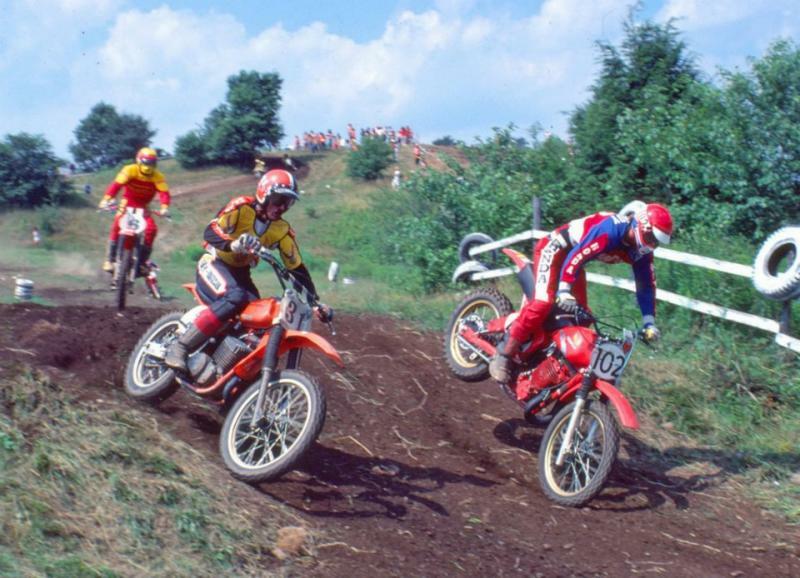 At the 500 National at Unadilla, Team Honda riders Marty Smith and Tommy Croft went 1-2 as Smith closed in on the 1977 500cc National Championship. Smith got an additional boost when his title rival Bob Hannah of Team Yamaha DNF'd the second moto after winning the first heat. And in a high-water mark in their mostly forgettable motocross program, "Rocket" Rex Staten finished third overall on the works MXer. Over at Hawkstone Park in England, the Russian KTM rider Gennady Moiseev took both motos in the 250cc Grand Prix, moving him a step closer to the '77 FIM 250cc Motocross World Championship. Swedish Kawasaki rider Thorlief Hansen finished second overall. Kawasaki's Ron Lechien won the Kenworthy's 500 National over Honda's Jeff Leisk, who hailed from Australia, and his Kawasaki teammate Jeff Ward. 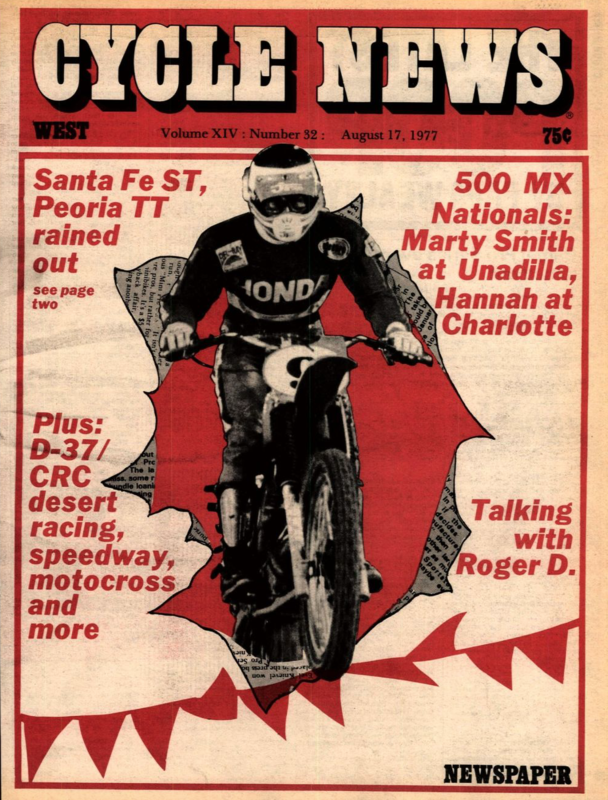 Honda's George Holland, on his way to the AMA 125cc National Championship, won the 125 Class—Holland went 2-1 to teammate Guy Cooper's 1-5 and the 4-2 of Suzuki's Donny Schmit. 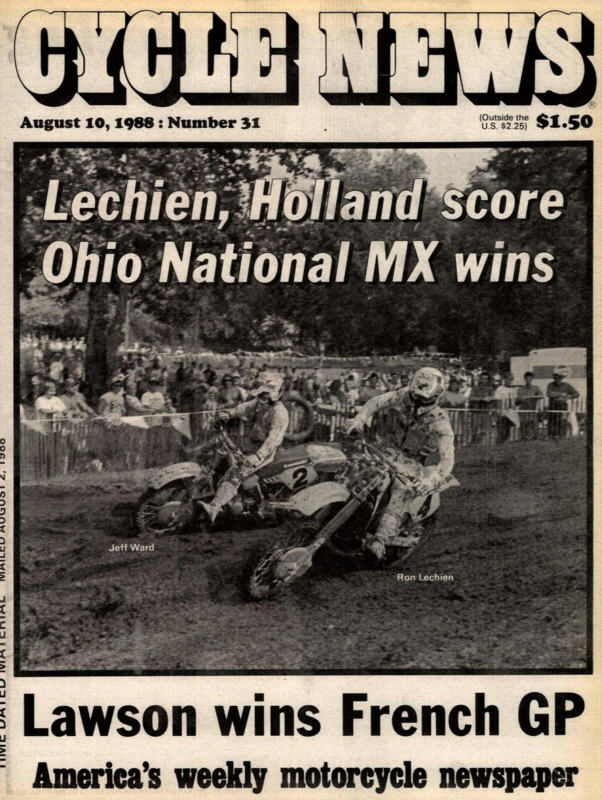 It was also announced at this race that Ward, Lechien, and Team Honda's Rick Johnson would represent Team USA at the 1988 FIM Motocross des Nations in France. Budds Creek hosted the 250cc U.S. Grand Prix of Motocross, and for the second year in a row, a European rider won. 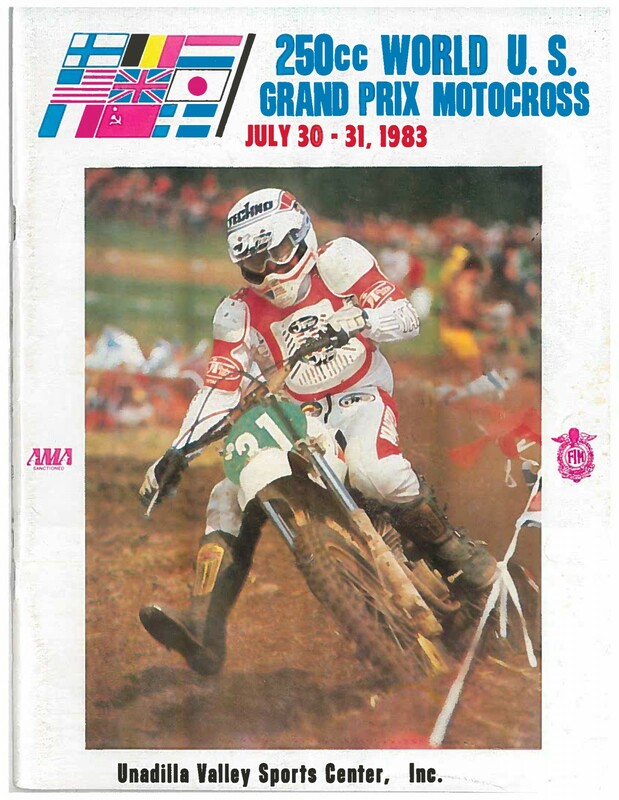 French Honda rider Yves Demaria went 5-1 to claim the overall win from the '93 USGP winner, Stefan Everts, and American rider Jeff Emig, who was actually competing in the 125 Class during the AMA 125 Nationals and won the first moto. 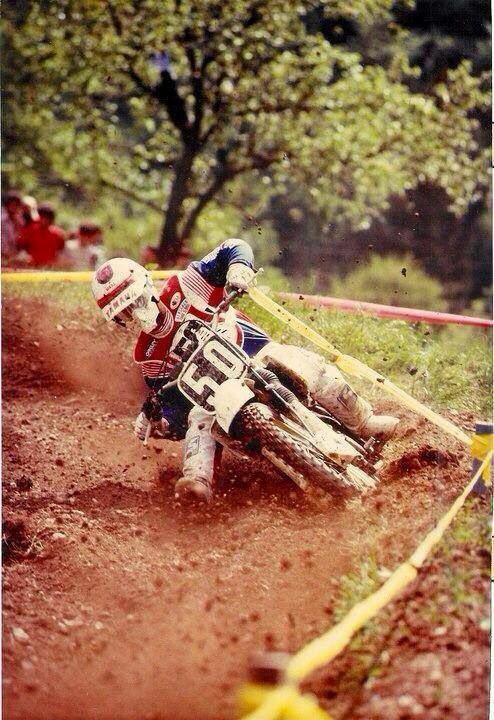 The crazy thing about this race happened to three-time USGP winner Jeff Stanton. The Honda factory rider got a good jump on the start, but a local newspaper photographer was literally standing in the middle of the track in the first turn and Stanton hit him! Check it out at the 8:25 mark on the video. Needless to say, Stanton was pissed.